Here is part 2 of "Make me a quesadilla" (part 1) and this one isn't oozing with cheese either! This year, we only went camping one time so I wanted to make sure we made something really good, yet still try to keep it simple. I ended up making Bobby Flay's quesadilla recipe. What's camping friendly about this reciepe is that you can do a lot of the prep at home and it only takes a single, small burner to cook (if you didn't want to make over a fire). Pour 2 cups of the barbecue sauce over chicken and let marinate for 2 hours in the refrigerator. Remove from marinade, season with salt and pepper to taste. Grill for 7-8 minutes on both sides or until tender and cooked through. Transfer chicken to a plate and let cool. Preheat oven to 450 degrees. Toss with the reserved 1 cup of bbq sauce. Place 8 tortillas on a flat surface and sprinkle with 2 Tbs of each of the cheeses and onion. Stack another tortilla on top and repeat. Brush the top of the tortillas with oil and sprinkle with the chili powder. Place tortillas on a lightly oiled baking sheet and bake for 5-7 minutes or until golden brown and cheese has melted. 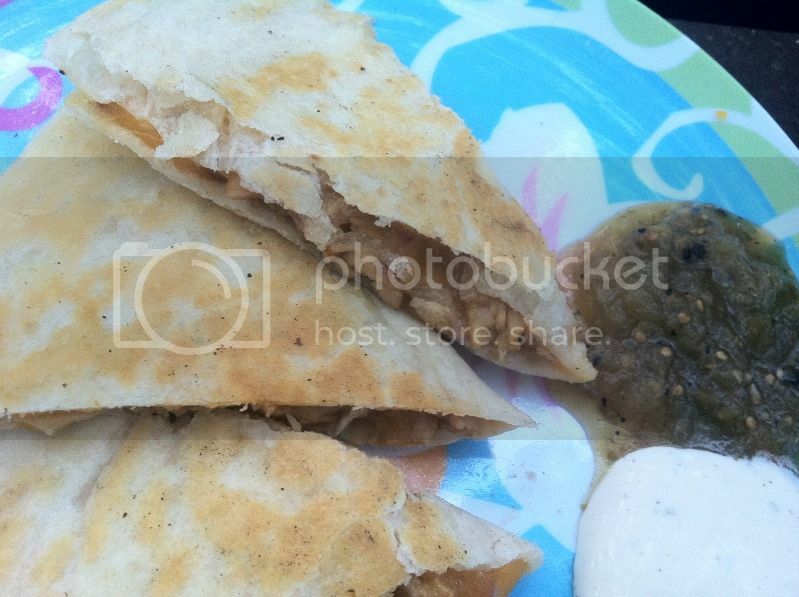 To serve, place 1 quesadilla on each plate and cut into quarters. Top with a dollop of salsa and drizzle with the buttermilk dressing. To make this camping friendly, I packed the cheese, onions, and cooked chicken in separate containers. Then, I just assembled the quesadillas at the campsite. If you don't want to use store-bought salsa and dresssing, then you can make those ahead of time as well. Either way, don't skip this part and use a traditional, red salsa. The mixture of buttermilk dressing and tomatillo salsa was so good it should not be missed!